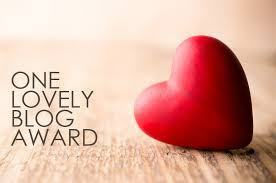 I learned today that a fellow blogger nominated me for the One Lovely Blog Award. Thank you so much for nominating me Marije Bijlsma, Sonadora!! Don’t get super excited it’s not exactly what you think. It’s sort of a chain letter for bloggers. But an award nonetheless and I’M THRILLED!! Just wanted to share my news. So. . . . . Here’s how it works. So, here are 7 facts or things about me. 15 Bloggers I am nominating . . . SORRY – I COULD ONLY COME UP WITH 8. THIS IS NEW TO ME AND IT WAS NEARLY IMPOSSIBLE TO POST THESE 8. I PROMISE TO FOLLOW MORE AND POST MORE.